Understanding the different types of networking cables and how they work can ensure you’re sending and receiving the information you need when and to where you need it. Twisted-pair cables, coaxial cables and fiber optics are all types of cable that do everything from transmitting telecommunication signals to delivering your favorite high-definition television program. This buying guide will explain the different types of networking cables and their uses, so you can feel confident you’re making the best selection to ensure you receive the level of performance you need from your system. Category 5e cables, also called CAT-5e, are the industry standard for unshielded twisted-pair cables (UTP) for in-home and small business networking. Often generically called Ethernet cable, the copper cabling can be used to connect phones, computer networks, home automation networks and audio/video distribution systems. CAT-5e cables typically consist of 4 pairs of wire (8 total conductors) wrapped in a single jacket. CAT-5e cables have an Ethernet capability of up to 1, 000 megabits per second (Mbps) and can often carry infrared (IR or remote) control signals, eliminating the need for a separate IR network. Coaxial cable, usually called coax, is a metallic cable most often used to carry television signals and connect video equipment. Coax provides protection from electromagnetic interference, allowing signals with low power to be transmitted over longer distances. The cables feature a central wire conductor covered with a dielectric or non-conducting insulator surrounded by mesh or a metal sheath. These components are then covered by a thin plastic layer for protection. Coax can often carry infrared (IR or remote) control signals, eliminating the need for a separate IR network. Coaxial cable was once widely used for connecting computers in local area networks (LANs) but has been replaced by twisted-pair cable. However, cable broadband uses the same coaxial cable that cable television uses. When pre-wiring your new home for technology, CAT-5e and coaxial cable are part of a structured cabling system that organizes and distributes connectivity throughout the home. Structured cabling connects each room on a direct run of high capacity category 5e and coaxial cable to a central distribution panel. This centrally located system then manages and distributes voice, data, audio and video signals throughout your home. To learn more see our Structured Wiring and Networking Panels Buying Guide. Fiber optic cables use glass or plastic threads to transmit data quickly and efficiently. While not as readily available for use in residential applications as coax and CAT-5e, fiber optic cable holds tremendous potential for delivering massive amounts of data, video and audio at unprecedented speeds. If you need to install cable over a long run and must have the highest quality, you'll want to consider fiber optics. Once you’ve determined the type of cable that works best for your application, the next step is to select the proper connectors. If you are installing a network yourself, you’ll want to make sure you have plenty of connectors on hand. Twisted-Pair Cable Connectors - The ends of CAT-5e cables are terminated in connectors known as RJ-45 jacks, which look like common RJ-11 (phone) jacks, only wider. Coaxial Cable Connectors - F connectors are often used with coax in broadcast and cable television equipment. F connectors provide an inexpensive and stable connection to these communications devices and other cables. Fiber optic cables require different types of connectors from those used with coax or CAT-5e cables. 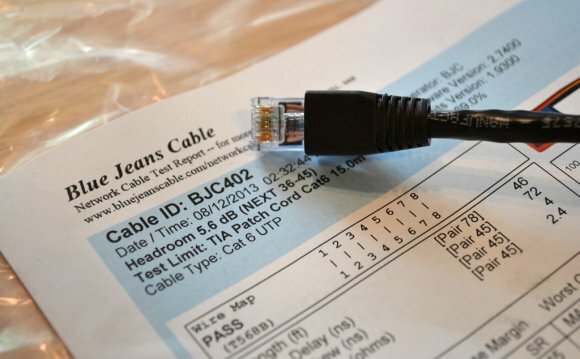 If you choose to use fiber optic cable in your home, you may need to install a special adapter in your computer to utilize a fiber optic connector. SC connectors - have a push-pull latching mechanism, which provides quick insertion and removal while also ensuring a positive connection.